We know in Miami that spring is just on its way for most of the country, even if it's been in the 80°s here for weeks and our inverted growing season is already starting to wrap up as the hot summer approaches. So, we sort of fake it: white asparagus and morels? Absolutely. 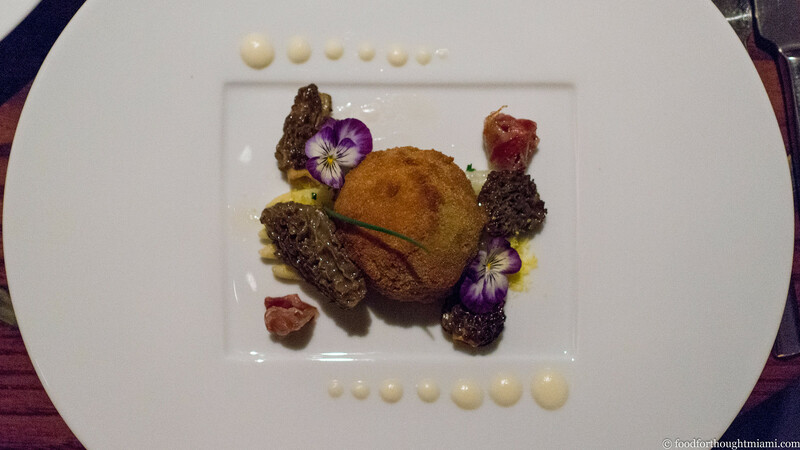 The centerpiece of this dish was the escargot "en surprise," the meaty little snails tucked within a crisp, almost croqueta-like shell atop spears of tender white asparagus, the plate dotted with a lush asparagus and white chocolate sauce and garnished with a couple ribbons of jamón ibérico. But the highlight was the morels, cooked sous vide and suffused with butter to further multiply their earthy, forest floor flavor. The next course was another highlight for me, one which Chef Griese announced with pride was "the best pasta being served in Miami tonight." 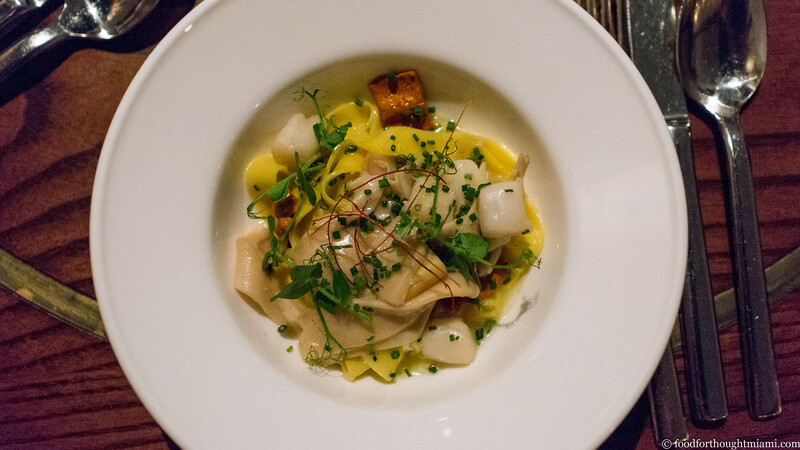 House-made saffron tagliatelle noodles, gossamer smooth, were combined with delicate Nantucket bay scallops, sea urchin, and nebrodini mushrooms (in the same family as royal trumpets and oyster mushrooms), cut in thin ribbons and delicately cooked so their texture mirrored the pasta, all awash in a lush (yes, buttery) seafood nage. I'll tell you what: he might be right. The savory courses concluded in classic fashion: steak and potatoes. But this was no ordinary steak and potatoes. Rather, it was a wagyu ribeye cap, cooked first sous vide to bring it to temp, then on the grill for some char, then finally held in a warm herb infused beurre monté. 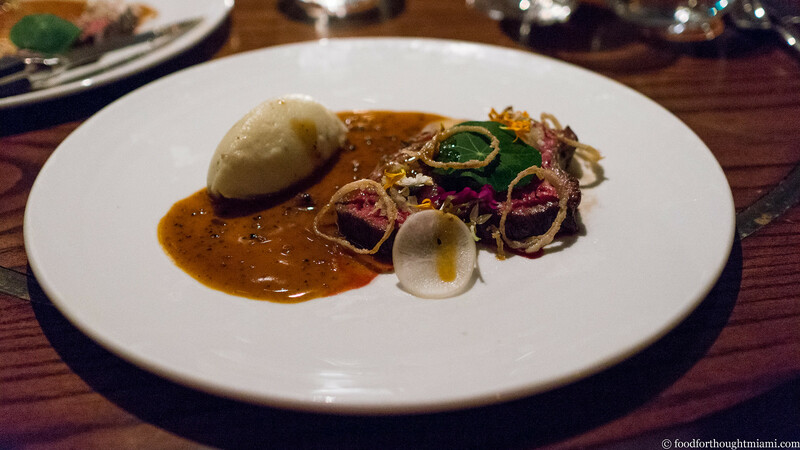 The lush, almost purple beef was garnished with a shallot "snow," ringlets of fried shallots, translucent coins of white radish, and nasturtium petals, then plated with a classic sauce perigourdine (yes, more truffles), and an equally classic pomme purée. 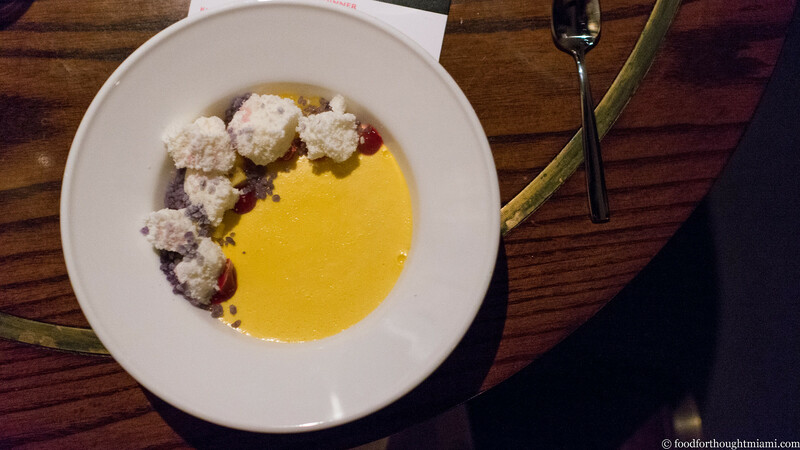 Griese veered a bit more contemporary for his dessert, a mango custard topped with a sprinkle of candied violets, raspberry purée and aerated, frozen vanilla ice cream, kept cold with a tableside flourish of smoking liquid nitrogen - a nice way to get the cold contrast of ice cream without the heavy, dense texture. The wine pairings by sommelier Stankovic Zarko were also pretty classically themed and consistently spot on: champagne and oysters, sauternes and foie, Alsatian riesling with the escargot, asparagus and morels, white burgundy with the seafood pasta, Washington State syrah with the steak, and eiswein with dessert. 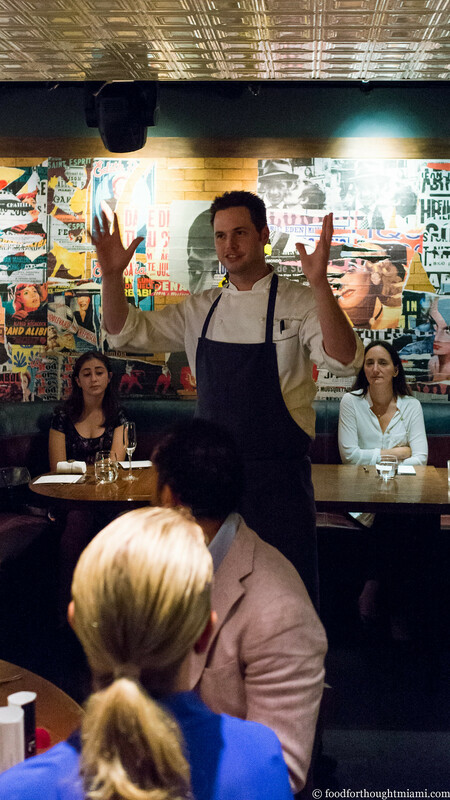 Chef Griese's enthusiasm, both throughout our planning for this dinner and during its presentation, was palpable. It's incredibly gratifying for us to be able to work with someone who has such energy and passion. A lot of old school, a little new, all very rich and indulgent, and all good. 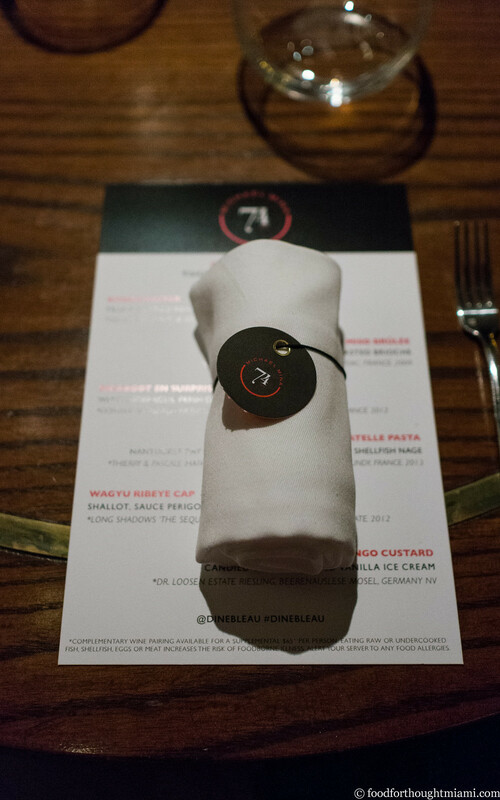 A big thank you to Chef Griese for crafting this fine meal, to all of his kitchen and FOH crew at MM74 for making it all happen so smoothly, and as always most of all, to the guinea pigs whose interest and support make these events possible. 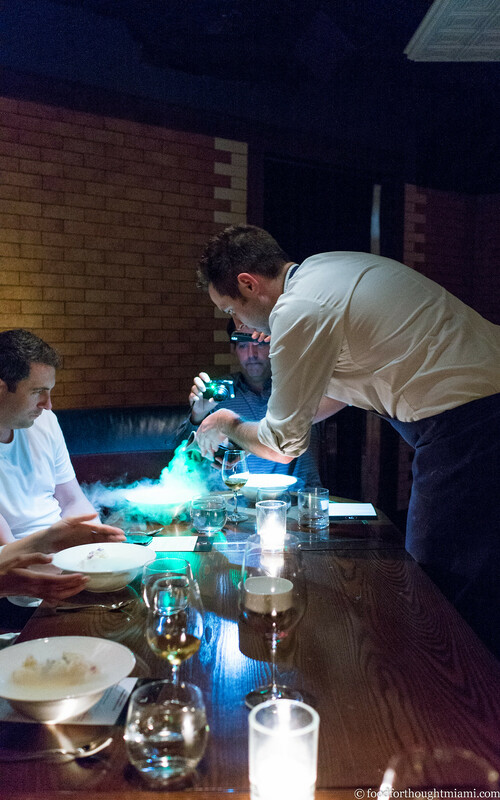 Griese also spent some time at Thomas Keller's Bouchon in Las Vegas, as well as Andre's and Le Cirque, before coming to Miami to work at the Setai, where he eventually was elevated to chef de cuisine of the Setai Grill. 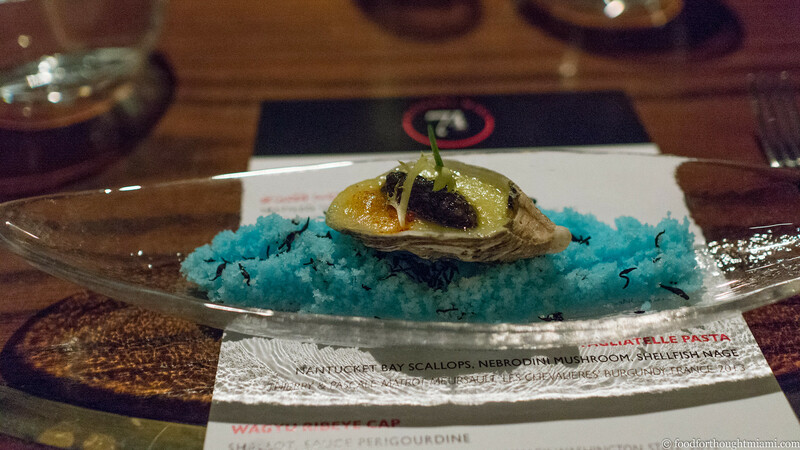 Keller's dish features a tapioca pudding bound in an oyster-liquor infused sabayon topped with barely poached oysters and a quenelle of osetra caviar. Griese momentarily went full-on food geek in talking up the dish to our table, explaining that once the steak is cooked sous vide, the myosin (one of the primary proteins in beef, along with actin) is denatured; when it's then held in the warm beurre monté, the butter can more easily infuse itself into the steak's fibers. So, yeah: wagyu beef with a little extra butter added. They use the same technique at Michael Mina's Bourbon Steak. I didn't catch the explanation but I'm assuming they foam the ice cream base using an iSi canister and quick-freeze it in liquid nitrogen. I suspect most folks balked at the price tag for the pairing ($65 including tax and tip) but I actually think it was a great value given the pedigree of the wines poured. Personally, I'd much rather spend $50 (before tax and tip) to sample some great wines than spend $20-30 to drink some average ones. That's not to say it isn't possible to put together great pairings at a lower price point; but in my experience, it doesn't always happen. 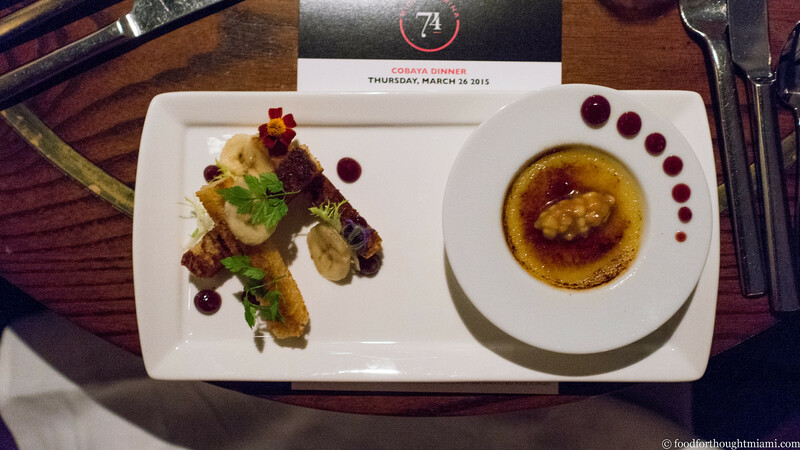 And not to toot our own horn too loudly, but I think this dinner had to be one of the best values of any we've put on: six courses including oysters, truffles, caviar, foie gras, and wagyu beef for $95 all in? Clearly, Chef Griese wanted to lay it on thick, and we were the beneficiaries.